It's been a long time since I posted about any of my projects for the simple reason that I haven't had any real time to work on them this year. Work commitments have not been particularly kind to my free time and there has been no progress on my 3D engine for TI calculators or any new electronics projects. I did, however, replace my ailing Zen Xtra digital audio player with a Zen X-Fi 2 earlier in the year. The X-Fi 2 supports simple application development in Lua, a language I had no experience with, so I spent a few days in April knocking together a game as a learning project. I've always been fond of Kevin Ng's Laserstrike and it seemed a good fit for a device with a touch screen. 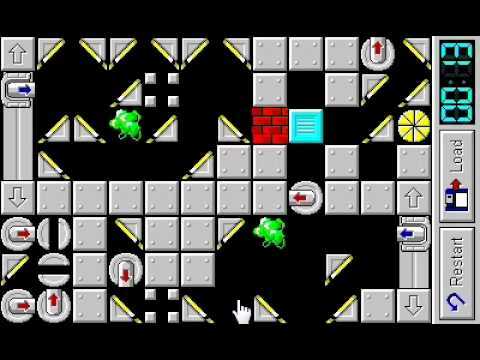 I used the smaller levels from Badga's Laser Mayhem as it let me use larger tiles, otherwise it would be tricky to tap the correct block on the X-Fi 2's 3" screen. Having not used Lua before the code is far from brilliant (for some reason I chose to represent the level as a string rather than an array, by way of example) but it works well enough and has occasionally kept me occupied on bus and train journeys. Rather than let the game stagnate on my hard disk drive I added a final bit of polish and have released it on my website. If you'd like to try the game but do not own an X-Fi 2 (which would be almost everyone reading this) you can play it in the Zen X-Fi 2 Application Development Kit (extract the game to C:\Creative\ZEN X-Fi2\Applications) but be warned that the simulator is a little buggy (it doesn't detect touch input in the 16 rows and columns at the top and left edges of the screen for starters). Fingers crossed I can get more time for what I enjoy doing in 2012. I have plenty of fun ideas, but little time to put them into practice!